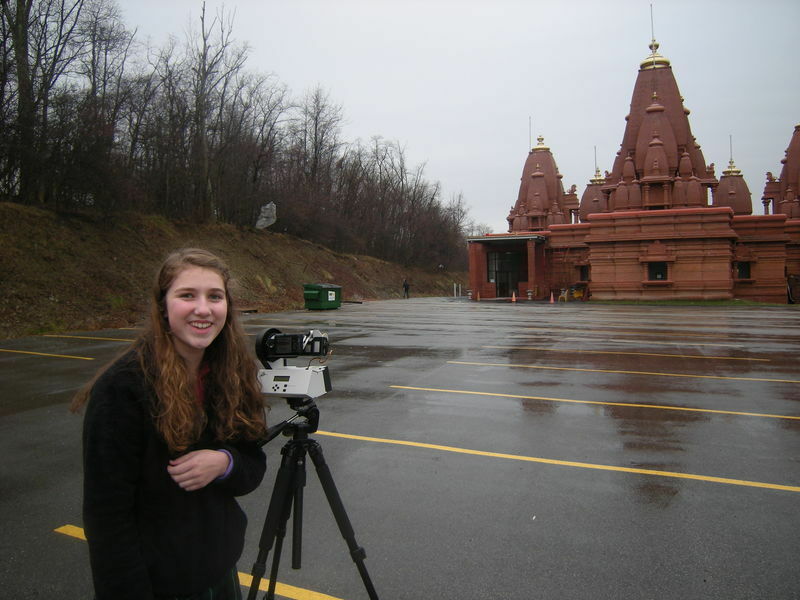 Ellis students have been Gigapanning different places of worship. Here you see two students pretty well soaked by the rain at the Hindu Jain Temple in Monroeville, PA.
We were treated to a nice tour, but we were not allowed to photograph inside. However, the outside of the temple is also quite beautiful. Posted by Karen Kaighin, the instructor of students at the Ellis School. The students are Valiha (with her coat on her head) and Annie. This is an ongoing project between Nijmegen and Pittsburgh. We have recently received some exciting letters from our pen-pals in the Netherlands. For now, we wish to share some of the activities we have enjoyed together thus far! 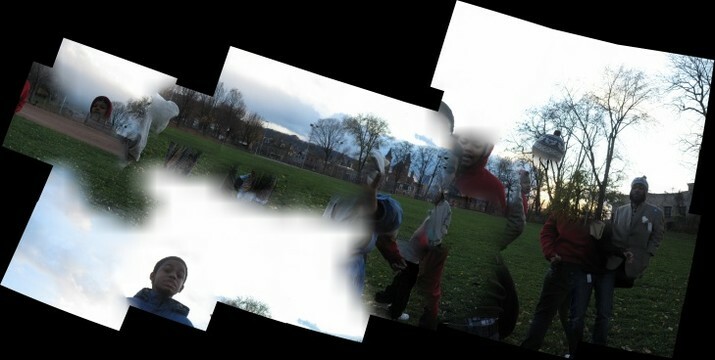 The Pittsburgh group decided to take photos outside of Arsenal Middle School, at the beautiful park behind it. We took two trial photos. Unfortunately, I was having trouble setting up the automatic button shooter, so I had to take each photo manually. This meant I could not join our students in jumping into multiple frames of the photo. This photo, as you can tell is somewhat inside out, but it has a cool effect. It is taken at Arsenal Park, showing our students playing in the Autumn park before Sunset! 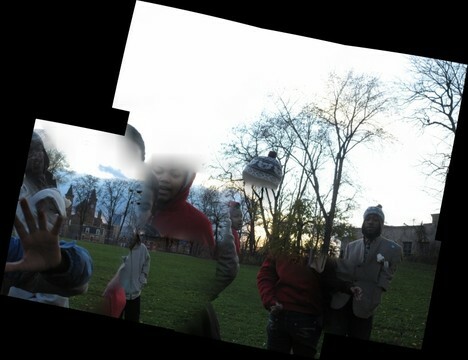 This was our Pittsburgh student's first try at the GigaPan. After selecting a scene and setting up the height and width that would be the GigaPan, the students jumped into frames as I tried to direct them. A cool lesson we learned from this activity was that some time accidents help you discover something new, or make something beautiful. In these photos, we are collaged over each other and blending into one another. In the second GigaPan, the finished product has the sky up top and below the ground. What does having the sky above you and below you make you think of? For one, it reminds us of our relation to the sun, and that our friends in the Netherlands are in a different timezone 6 hours ahead, where the sun may have gone down just that much. It also makes us think about the way we are constantly moving, from classroom to classroom, from block to block, or the way we have moved from country to country and are now standing on a new ground. My class and I tried out Gigapan and it was a great experience. Working with the camera was fascinating and I personally enjoyed exploring how a Gigapan imager works. I amproud of my students’ work in taking the picture, which came out very well. It is nice to see how enthusiastic the students are about interacting with others through The Painting on the Wall project. Gigapan offers an exciting opportunity for students to interact with each other as part of a global community. "I liked working with the gigapan taking pictures of graffiti"
This is first followup on the time lapse photography done yesterday. Randy and others (Anne, Josh, and Dror) were shooting from about 6am to midnight yesterday. Randy said that over 60,000 photographs (at 18 megapixels each) were captured; one every four seconds, on each of four cameras, clicking in unison. The cameras captured sunrise, morning commute, midday traffic, the coming & going of clouds over the city, coal barges going up & down the river, evening commute, sunset, moonrise, drivers & ferry boats streaming toward Heinz Field, and the Steelers game! It will be days until all of these images are stitched into a zoomable video, but in the meantime, here are some snapshots. Four Canon T2i's running off a car battery, each camera had a 128 GB memory card. He plans to be at that location shooting picures every second or two from 5:30am until 11pm! If you're in the area, you could drop by and say hi. Or if you bike/walk along the Mon Wharf or some other location downtown visible from the top of McArdle Roadway, you'll be in the video! Wear bright colors! Here's a simple time lapse of the Paddle-at-the-Point event last year, shot with a single camera. Thursday's time lapse will use four cameras shooting in unison. (I posted this same message to the bike-pgh bboard http://bike-pgh.org/bbpress/topic/appear-in-a-time-lapse-video-of-downtown-on-thu-128#post-90344 to publicize it some). 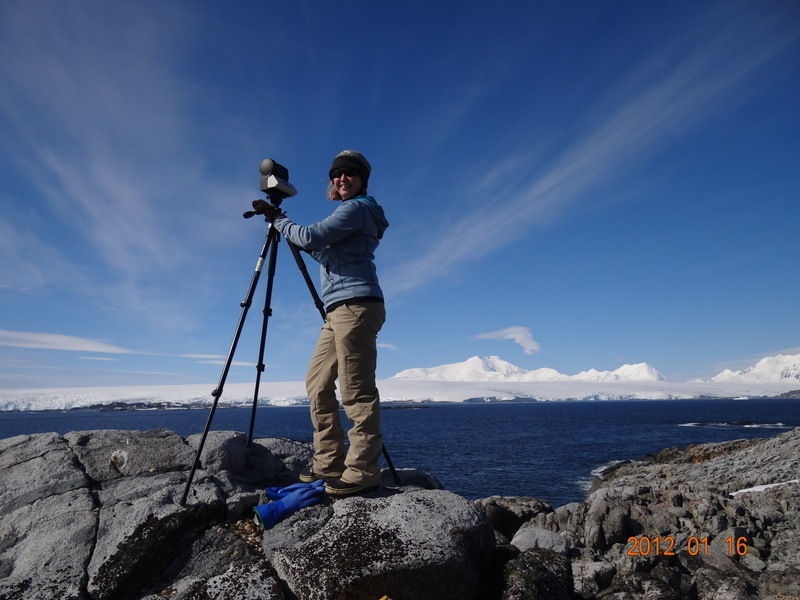 Year Two of the GigaPan Outreach Project Kicks Off! The June Harless CREATE Satellite held a two-day training on September 30th and October 1st at Huntington High School in Huntington, West Virginia. Around 40 teachers from Cabell, Wayne, Nicholas and Randolph counties from year one and two of the grant learned about GigaPan technology and how to integrate it into existing curriculum. Advanced integration strategies for every day use in reading, writing, vocabulary, social studies and science were examined as well. Teachers left with projects planned and ideas ready to incorporate into their classroom. We're excited about beginning a new year with GigaPan and looking forward to working with a great group of teachers! Join us for a Reception and walking tour of “Panoramics & Precision”, a new exhibit of large scale Gigapan prints installed in the School for Computer Science. This afternoon at 4:30pm in the 5200 corridor of GHC. Light refreshments will be served, and the event is open to the public. The prints have been previously on display at the Carnegie Museum of Natural History. See PDF for location of prints around the building.